The pyramids weren't the only monuments of ancient fallen civilizations I included in Overnight News Digest: Science Saturday (Pyramids on Star Wars Day). I also wrote about restoration efforts planned for Cleopatra's Needle and the Colosseum. 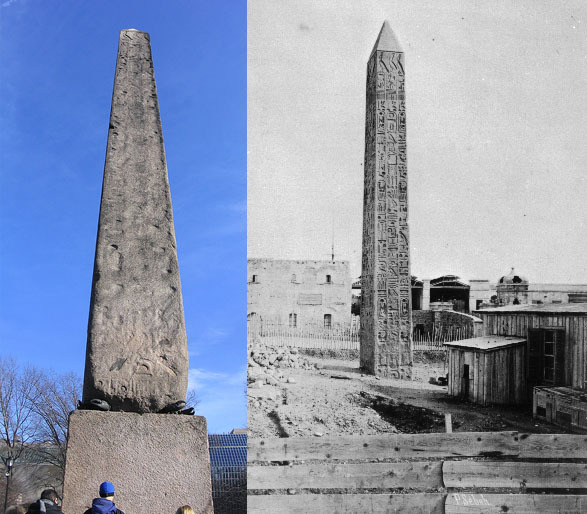 It turns out that the tale of Cleopatra's Needle in New York City is a story I tell my students about the relative power of moisture over heat as an agent of weathering. Since I'm both lazy and a believer in the virtue of reusing and recycling, I present Wikipedia's version of the story. The surface of the stone is heavily weathered, nearly masking the rows of Egyptian hieroglyphs engraved on all sides. Photographs taken near the time the obelisk was erected in the park show that the inscriptions or hieroglyphs, as depicted below with translation, were still quite legible and date first from Thutmosis III (1479–1425 BC) and then nearly 300 years later, Ramesses II the Great (1279–1213 BC). The stone had stood in the clear dry Egyptian desert air for nearly 3000 years and had undergone little weathering. In a little more than a century in the climate of New York City, pollution and acid rain have heavily pitted its surfaces. In 2010, Dr. Zahi Hawass, sent an open letter to the president of the Central Park Conservancy and the Mayor of New York City insisting on improved conservation efforts. If they are not able to properly care for the obelisk, he has threatened to "take the necessary steps to bring this precious artifact home and save it from ruin." Four years later, Gothamist describes the latest effor to properly care for Cleopatra's Needle in Oldest Man-Made Object In NYC To Be Cleaned With Lasers. The oldest man-made object in Central Park, and the only thing in this city using bronze crab claws as supports, is in need of a wash down. The Obelisk, also known as Cleopatra's Needle, will be cleaned during a conservation project, the Central Park Conservancy announced today. Stabilization and cleaning of the 3,500-year-old Obelisk, situated right behind the Met, starts this week, and is part of an effort to "promote its long term preservation and enhance the public’s understanding of the ancient artifact." Working with the Met and the Parks Department, the Conservancy will kick things off with a cleaning... with LASERS, which they found to be "most sensitive to the stone’s surface and safest for the environment." The laser's infrared light will vaporize the dirt, which has been accumulating throughout the years. Removing the dirt would only be a first step. The obelisk would look better, but I don't know if it would reduce the weathering or restore the carvings. Still, I'm glad to see something done to preserve New York's Cleopatra's Needle. Also, it does make for a cool story to tell the students, as I found out when I incorporated this detail in my lecture about weather a couple of weeks ago. Follow over the jump for news about the restoration of the Colosseum in Rome along with one of the indignities the monument has suffered. Eric Sylvers of The Wall Street Journal reports on The Colosseum's Badly Needed Bath. Rome's Colosseum will soon look a little more like it did in the bad old days two millennia ago, when it first hosted gladiator fights, mock naval battles and public executions carried out by wild animals. The $35 million project—the first full cleaning in the Colosseum's history—aims to return it to its former splendor, while also strengthening the overall structure. Earthquakes, the pillaging of pieces of its outer frame, heavy car traffic and Rome's nearby subway have damaged key parts. The scrubdown should also reveal secrets of how one of the world's most famous, and often neglected, monuments remained standing for 20 centuries. Some surprises have already emerged during the project's first six months. The restorers expect to uncover the first five arcades this summer. Visitors will find that the monument's Travertine limestone is once again a vibrant dark ivory—what Rossella Rea, the Colosseum's director, calls "yellow ivory." Pollution had turned the stone a variety of colors from dirty cream to jet black. The completely cleaned stadium will probably be a delight to see, even more so than before. May the ruins of our civilization stand up to time so well and future cultures take as good care of them. Now for that indignity from The Local (Italy): Canadian tourist steals brick from Colosseum. A Canadian teenager got into hot water with police on Monday after she was caught trying to steal a brick from Rome’s Colosseum, stashed away in her backpack, Italian media reported. Maybe the Roman authorities should come up with a story about how the pagan gods would curse anyone stealing from the Collosseum, much like anyone removing volcanic rocks from the island of Hawaii is supposed to be cursed by Pele--but that's a different story I tell my students. After zombies and vampires, what's next?